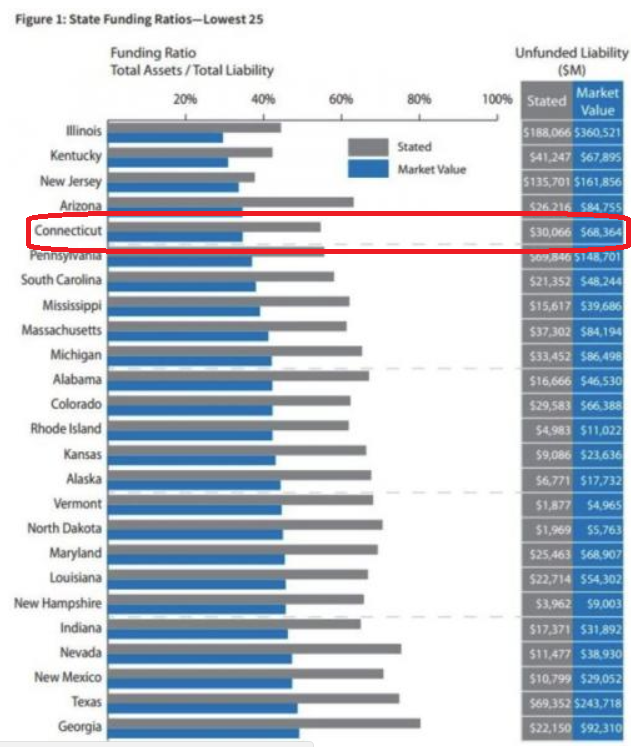 As we've pointed out time and time again, the government of the state of Connecticut is sinking into debt at a time when rising interest rates and a shrinking tax base are threatening to crush the state's economy. The primary culprit? By most accounts, it's public-sector unions, who have leveraged their enormous political influence in the state to preserve generous retirement benefits, who are contributing the most to the present economic crisis. Generous benefits have forced Democratic and Republican governors to defer payments, leaving the system dangerously underfunded. As the Wall Street Journal editorial board explained earlier this week, Connecticut's labor laws convey many advantages on public employee unions. Local mayors say their only hope for reining in retirement costs would be for the state to change these laws. At the very least, the Connecticut Conference of Municipalities, a lobbying group for Connecticut's towns and cities, is asking that some collective bargaining rights be curtailed. While that request - made in a solidly Democratic state - will likely trigger unfair comparisons to Wisconsin, the fact that it's even being made tells you something. Even the Democrats know they can't tax their way out of this mess. That’s because state lawmakers have little flexibility to cut spending since Mr. Malloy extended collective-bargaining agreements through 2027 despite receiving few concessions from government unions. Meanwhile, tax revenues have been declining amid a sluggish economy and retirement costs are soaring. About 35% of state revenues go to debt service and retirement obligations. Connecticut’s annual teacher pension contribution is projected to quadruple by 2032. While mayors say they’re willing to pay more for pensions, many want the ability to shift their employees to defined-contribution plans that give them control over the costs. But will Democrats in Hartford defy their labor friends and rescue Connecticut’s underwater cities? Connecticut voters are only beginning to understand the damage from two terms of Mr. Malloy.